BB Magazine's new issue is now available! This well assembled issue was inspired by the independent fashion market. We recognize and honor your commitment to keeping both independent and mainstream fashion markets solid and profitable. BB Magazine takes tremendous pride in promoting you, and telling your story behind the fashion. One of my favorite interviews is with Catou Wear's Creative Director/Lead Stylist Josue Champagne who states, "I dress like I give a damn." Very powerful interview with one of the best dressed men in this Era of New Gentlemen! I know you will enjoy this amazing issue, especially with breathtaking images from Miami Swim Week 2018, which was photographed by Carl Maiorino. 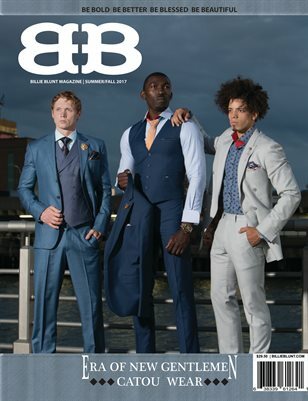 Our cool & debonair magazine cover was photographed by Dennis Madigan. Our three cover models from left to right are Nicolas Unerinveose, Rick Brown, and Henry Golde.